Big news, friends: Healthy food subscription company Daily Harvest (you probably know them for their smoothies, soups, and grain bowls) is adding a line of cookies to their offerings, starting November 8th. Think of these as your standard break-and-bake cookies—except they’re already divided into neat little circles, and they’re actually really damn healthy. All three flavors—coconut lemon, chocolate chia, and cacao nib—are gluten-free and made with whole, plant-based ingredients like sunflower seed butter, avocado, and chickpeas. This one is Women’s Health’s fave. It tastes like a coconut macaroon with a hint of ginger and lemon. These cookies are made with coconut cream, coconut flakes, cassava flour, coconut oil, maple syrup, lemon peel, ginger, flaxseeds, cinnamon, and Himalayan pink sea salt. Per cookie: 100 cal, 7 g fat, 10 g carbs, 1 g fiber, 5 g sugar, 1 g protein. These cookies taste like a fudge brownie which is never a bad thing. They’re made of maple, sunflower seed butter, avocado, cacao, chia seeds, reishi mushrooms, and baking soda. Per cookie: 100 cal, 6 g fat, 11 g carbs, 2 g fiber, 6 g sugar, 3 g protein. This is basically a healthier version of your standard chocolate chip cookie. It’s made with chickpeas, maple syrup, sunflower seed butter, avocado oil, pumpkin, vanilla, cassava flour, flaxseeds, Himalayan pink sea salt, maca, baking soda, and cacao nibs. Per cookie: 100 cal, 4.5 g fat, 14 g carbs, 2 g fiber, 6 g sugar, 2 g protein. Pro tip: If you baked a batch to enjoy all week, pop the cookie in the microwave before you eat it for delicious results. 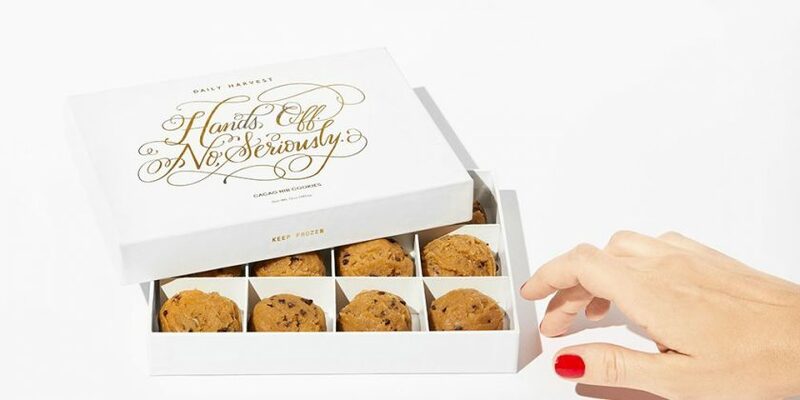 The cookies will also be available in limited-edition gift boxes that includes 36 cookies (12 of each type) for $48 between 11/9 and 12/31. You can purchase the cookies here.